With a voice drenched in the soul of Muscle Shoals and songwriting straight from the back roads of his home state of Alabama, Drake White is one of country music’s true revivalists. His 2016 debut album Spark showed off his ability to fuse uptempo funky songs like Equator with the emotion filled growl of the outstanding Makin’ Me Look Good Again. Since then White has wowed the UK crowds at the Country 2 Country Festival, as well as hitting the road with Kip Moore on his ‘Plead The Fifth Tour’ in both the UK and USA. Ever-eager to share music with his fans, White whets our appetites in 2018 with this new five-song EP Pieces. The EP kicks off with a song co-written by Old Dominion’s Brad Tursi, Troy Verges and producer/writer busbee, Girl In Pieces. The first thing that strikes me on this jaunty and upbeat number is the similarity to Jason Mraz and other pop singer-songwriters. This isn’t a criticism though! The song has a big old hook in the chorus and could be the perfect song for White to make some more progress on country radio. It contains all of the elements that would make it a summer hit without losing any of White’s style. His soulful voice drives this song about picking up a heartbroken woman into a pop-soul-country sonic plane that’ll get your foot tapping. Summer 2018 – here’s your soundtrack! Next up is Grandpa’s Farm, a song which comes straight from Drake White’s wheelhouse. It’s a rootsy, guitar driven song about those sunny days spent out in the country. It’s co-written by Brent Cobb, so you know it’s 100% country-fied! The great thing about these songs from Drake White is that you know that he’s lived them and is passionate about them. Musically the song culminates in a Joe Cocker-esque crescendo, with gospel backing singers and Drake riffing over the huge guitars and drums. This one is sure to be a live favourite and reminds me a lot of Drake’s cover of A Little Help From My Friends which is often in his live show. Happy Place takes the vibe into a much more chilled out and relaxed summer feel. This is the first song on the EP that Drake had a hand in writing. It’s a fantastic upbeat love song about finding that one person who makes you happy no matter what is happening. Again, this song shows how easily White can shift between intense and big songs to jaunty campfire music. Track four is Nothing Good Happens After Midnight, for those Jake Owen fans, this isn’t a cover of his recent tune from the American Love album. It’s another upbeat summer tune about spending the night with the right person and never wanting to leave. White’s soulful vocals croon the words “I just wanna stay right here, until all the stars in the sky disappear”. It’s a great song that really encapsulates how you can just disappear into your own world together when you’re with the right person. It’s another example of how White can produce a superb love song. The EP finishes on The Best Is Yet To Come, a song which could perhaps be seen as a promise from White for the future. It’s the second song on the EP that he co-wrote and is filled with all of the emotion of a typical Drake White love song. He sings “I could never love you more than I do tonight, but I know I will tomorrow when I wake and hold you tight”, conveying every little bit of the emotion that the song deserves. It’s a brilliant way to end the album and really does hint that the best may very well be to come from Drake White. Drake White is so passionate about his art that he admits he’d love to be constantly releasing music. Since the release of Spark, White says that he’s written countless more songs and has been desperate for them to reach the fans, this EP gives us something to keep going. However, Pieces isn’t just an EP that serves to keep fans satisfied before another album , it’s a fantastically well-rounded and well produced record in its own right. With songs such as Girl In Pieces, White and producer busbee have produced music which could appeal to country radio but doesn’t sacrifice any of White’s signature sound. 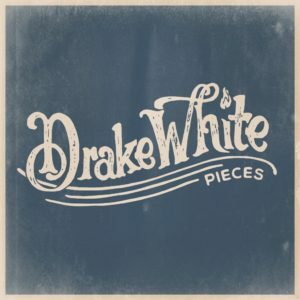 If Pieces really is a taste of what is to come from Drake White, then his fans have every right to be excited. This could very well be his year to make a big breakthrough and Pieces is just the start of that! Pieces is only available as a digital download. Grab your copy here! 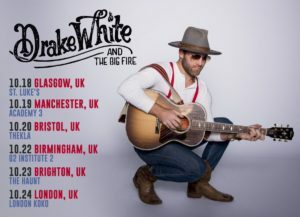 Drake White tours the UK in October (dates below). Get your tickets here!